- Engine: Supercharged Jaguar AJ-V8 Trans-Am race engine, stroked out from 4.5 to 5.0 liters. Custom Rocketsports valve train, Borla stainless steel headers, Bosch fuel injection, re-engineered rotating assembly, dry sump oiling. - Power: 550 bhp / Torque: 500 lb. ft.
- Performance: 0-60 mph in 3.9 seconds. Top speed 200 mph. - Body: Additions include new front and rear spoilers, underbody air tunnels, sill extensions. Track widened by 2.8 inches total, rear 3.0 inches total. Gross weight 3,400 pounds. Overall height reduced by 2.75 inches at windshield. 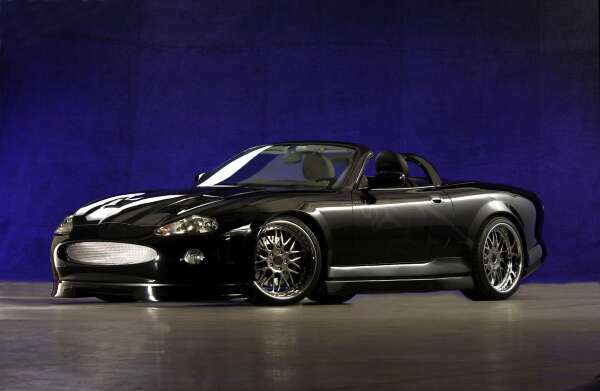 Picture this... a sensual XKR convertible, black on black, fitted with a wind tunnel developped aero package, ready to hug the road with massive 20x11 wheels and a lowered suspension. Under the louvered bonnet, a 5 litre supercharged AJ-V8 engine developping 550hp and 500 lbft of torque and.. are you ready for this... matted to a 5 speed transaxle MANUAL! For those North American Jaguar enthusiasts who have been hybernating in past 3 or 4 years, Paul Gentilozzi's Rocketsports is the race team who brought Jaguar back into Trans Am racing with great success including two manufacturers and drivers titles. Gentilozzi himself is a four time Tran Am champion and one of the most succesful driver in the long running series. They also have been working with Jaguar on a number of projects including developping a race version of the Jaguar V8 engine introduced this year in the XK8 of Trans Am Champ Scott Pruett and the agressive X-Type concept racer presented last year. The XK-RS is not a regular XKR with a body kit, it was engineered to bring 200 mph / sub 4 second 0-60 performance to Jaguar luxury flagship GT. Careful aerodynamic work by Rocketsports engineers include agressive spoilers and side skirts along with underbody wind tunnels expected to increase downforce by 100%... Using a transaxle manual gearbox not only makes a car a real enthusiasts' sports car but also improves handling as relocating the transmisson results in a 50/50 ideal weight distribtution.